I never thought that death and dying would be a part of my everyday life – but it is here in Liberia. Today I learned of the death of one child with an inoperable tumor and of another patient, Levi, who was in the process of dying. Levi’s uncle phoned saying that the 10 year old boy was critically ill at Catholic Hospital. Levi has been struggling to survive from Burkett’s Lymphoma for the last 2 years but the chemotherapy hasn’t stopped the disease. 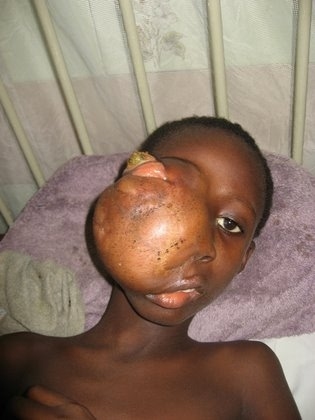 The tumor has continued to grow causing his eye to protrude up into his forehead and pushing his nose out straight – as if a watermelon had been shoved into half of his face from his forehead down. Now the tumor was closing off his airway. I phoned the doctor to discuss the situation and she told me she thought he’d already died as she’d seen the family crying in the hallway – but I might want to check with the family to be sure. I had met the family 4 months earlier while checking on another patient at the hospital. The mother had showed me Levi’s papers from Mercy Ships and told of her financial struggle in getting the chemotherapy for Levi. I told her we would assist her and that she shouldn’t worry about that burden any longer. As I drove to the hospital I dreaded what I would find – a grieving family or a child struggling to breath. As I entered the room I could hear the labored breathing and knew I would have to witness a child suffering. When I asked the nurses what they had given him for pain they basically gave me a blank stare. In a country where there are no narcotics there are few options and no hospice mentality. The nurses rarely call the doctor on behalf of a patient – they just wait for them to come and ask about the patient. It was apparent that the doctor had not been to see Levi for at least 5 hours and meanwhile his family was watching helplessly as he struggled with every breath. The Social Worker entered the room with me and within a few minutes we were both standing in the corner crying. I couldn’t sit there any longer so I called the doctor and asked if she would prescribe Morphine if I brought it to her. I had a small amount left over from another terminally ill patient. After getting permission from the Hospital Administrator, the doctor met us and wrote orders for the patient to receive the morphine. Thankfully Levi was able to swallow the medicine and within a half hour was breathing a little easier – but still very labored. The agony that both Levi and his mother were experiencing was more than anyone should have to bear and all I could do was cry out to God to provide peace and comfort in the midst of it all. Hopefully my presence brought some of that for his mother as I held her and let her cry – something not encouraged in Liberia. I left the hospital an hour later knowing I had done all I could – but grieved once again by the great suffering. Scroll Down to see photos of Levi taken on June 15, 2009 when his tumor was smaller and not yet occluding his airway. Please be aware that some may find his appearance disturbing.